There are many devotees who are mere fortune seekers. Sant Dnyaneshwar Maharaj talked about them in 12th century and it is highly relevant in the current situation. He reaches the height of happiness when he gets the thing he likes and he sinks due to sorrow when he gets what he does not like. One who worries because of favorable and unfavorable circumstances, however highly intelligent he may be, is in reality an ignorant person. He is devoted to me (Vishnu) but that devotion is with a material objective in mind. He makes a show of my devotion but keeps his sights on pleasures. If he does not get them after being devoted to me, then he gives up the devotion saying that the talk of God etc. is all lies. Like an ignorant peasant he sets up different deities and after failing with one he goes to the next. He joins that Guru tradition where there is a great pomp and show, receives Guru-mantra from him and considers others as ordinary. He behaves cruelly with living creatures but showers special love on a stone idol. But his love is not steady in one single place. He makes my idol and installs it in one corner of the house and himself he goes on pilgrimage to places of other deities. He offers devotion towards his family deity and on auspicious occasions he worships other deities. After installing me in the house he makes vows to other deities. 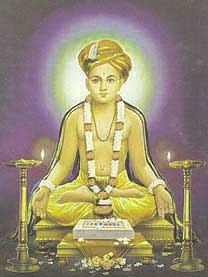 On the day of Shraddha he belongs to the forefathers. He worships cobras on Nag Panchami day as much as he worships me on Ekadashi day. On Chaturthi day he becomes a devotee of Ganapati and on Chaturdashi day he avers, " Oh Mother Durga, I am a devotee of only you." He leaves the daily rituals and incidental actions during Navratri and sits for the reading of Navchandi and on Sunday gives an offering of Khichadi to the deity Bahiroba. Then on Monday he rushes to Shivalinga for offering Bel leaves and thus he somehow manages to perform the worship ritual of all deities. That devotee performs the worship ritual of all deities without taking rest for a moment just like a prostitute who demonstrates her love for all the people in the town. Such a devotee who every now and then rushes to different deities is ignorance reincarnated. Sant Dnyaneshwar Maharaj wanted to convey the message that those who worship Bhagavan for desire fulfillment and out of fear is unable to see the truth. There is no end to the suffering of such people. They will never find happiness and self realization.